I originally found my dress at another store but I wanted to order through Angel Bridal. Everyone there was so accommodating and made sure my dress was perfect. I had a few fittings before taking the dress home because Rosemary wouldn't let me go before everything was complete! I loved my dress and how it fit perfectly! I went into Angel Bridals yesterday with my daughter & her bridal party looking for bridesmaids dresses. They had many different styles for the ladies to choose from. Some wanted off the shoulder, while others wanted some type of straps. Ro assured us that they could add any size strap from spaghetti to lasagna:) Everyone left there feeling happy with the choice they made and I was even able to find my "Mother of the Bride" dress! Very happy we went to Angel Bridals first (and last) we never felt rushed and their prices are extremely reasonable. We can see why they have such rave reviews. Words can't express how happy I am that I found Angel Bridal. I purchased my wedding gown elsewhere, and found Angel when I was searching for bridesmaids dresses. I ended up choosing Angel for bridesmaids dresses, my mom purchased her gown here, and then they saved the day when my alterations at another salon went horribly wrong! I absolutely loved my Sophia Tolli dress and its cathedral length train but problems arose when it was time to figure out the bustle. The shop I purchased the dress recommended either a one point over bustle or 3 point over bustle for my heavy lace train. Not only did it look like a mess & drag on the floor, it would have never held up through the night. After a great experience shopping for bridesmaids & mother of the bride dresses, I knew I wanted to bring my dress to Angel for my (corrective) alterations. They did such an amazing job on my hard to bustle train. I ended up having a whopping 25 or so points (french & over bustle combo). I knew I was in great hands the second they started to dissect, brainstorm and pin my dress. I was beyond impressed and so thrilled with the final look. The bustle stayed up all night and Angel Bridal is to thank! I highly recommend Angel Bridal. My only regret it not finding Angel earlier and purchasing my dress from them!! Rosemarie, Vicki, and Rosalba are amazing, sweet, knowledgeable and SO talented! I had gone to a few local bridal salons and then I even hit up a few of the commercial shops. 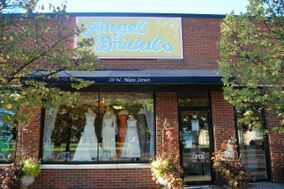 My mother and I were driving down main street and a particular bridesmaids dress in the front window of Angel Bridals caught our eye. We had time to kill so we stopped in to check it out and that is when we met Rosemary. There are no words to describe the overall positive, calming, loving energy that comes over you when you walk into the store. While looking at some dress options for my girls, I found my mother in the far back corner of the store, sobbing, holding a dress. She was in love. After nearly and hour and some encouragement from Rosemary, I tried it on. Once I saw myself, I was sobbing too. Throughout the planning process I was frantic, anxious and feeling discouraged. On this day, everything changed. I was happy! I was confident! I found my dress! And my bridesmaid's dresses too! Rosemary, Vicky and Rosealba are truly angels. They make you feel like family and truly do care about every person that comes through their doors. Every time we were in for a fitting or just for a quick "hi and bye", we encountered another bride, mother, or customer who had worked with the ladies in the past and were back for more! The alterations that were done made my feel like I was wearing a piece of art. I cannot say enough about how my expectations were exceeded. Go visit them and you will not be disappointed! This is my 3rd time using Angel Bridal but this time for my own wedding. They have been amazing from beginning to end. Vicki knew when I was having trouble deciding on my wedding dress exactly how to help and it was after leaving there I knew what dress is my wedding dress. Even though they did not carry the designer they were able to order the dress for me and at the lowest cost. All of my bridesmaids ordered their dresses their as well and they all had made comments on how great everyone is there. Even when the designer had made a mistake on my matron's dress it was handled very quickly and their was no issues with the dress when it came in. My mother and my future mother in law also ordered their dresses their as well and they loved them. Even customizing my future mother in laws into a halter. All the ladies at Angel Bridal are very helpful and friendly. moh here, these ladies are amazing. you feel like you are with family. everyone is super help and truly accommodating. kind of sad i picked up my dress and don't have a reason to go back. They were so nice and easy to work with! They give you the personal attention that I didn't get from other stores. My dress was beautiful and was a great price. The women at Angel Bridals were such a pleasure to have met and glad I found their shop for my bridesmaid dresses! With dilemmas always arising as a bride, Angel Bridals helped keep me calm when needed. ..While I had to switch a bridesmaid out and switch another girl in with only a few fittings to spare and the girls being different, Angel Bridals helped make the dress work. Everything planned out and recommend Angel Bridals dress shop and also their tea party arrangements! If you are looking for a place that takes the time to find the perfect dress for you and makes you feel special, then this is the place to go. The owners are always there and will work with you on pratically anything you want. The were wonderful to work with and made sure that I stressed about nothing!!!!!! We most definitely highly recommend this place to anyone looking for a wedding dress, bridesmaid dress, or mother of the bride dress. If you find something you like in another store, more than likely, they can get it for you. 5 stars all the way! A most lovely team of caring and beautiful souls awaits you at Angel Bridals. I cannot say enough about their personalities and service..... I was told the seamstress had "hands of gold" - this is an understatement. Fabulous! Angel Bridals went above and beyond to make my dress fit perfect for my wedding. They were very professional and cost effective, They were great at handling getting two wedding gowns altered within a week of my wedding. The seamstress did an amazing job. I Highly recommend this vendor. A small bridal shop where you get a lot of personal attention and great service. I found my dress in another shop and brought all the info to Angels, where they ordered it for me. The bridesmaid dress I found originally wound up to be discontinued and the staff at Angels was so helpful in locating and ordering new dresses. They are so friendly and have a lovely selection of accessories. Highly recommended! So, what can I say about the Team of Ro & Vicky...ABSOLUTLEY Fantastic! They are the loveliest women you can work with. I was actually a little sad after my last fitting and picking up my dress becuase it was like being with family when you were their. I happen to just see their shop a few times since I have friends in that area. As soon as I walked in it was like being home. I didn't even pick my dress. Ro told me to try it and I initially said "no, not my style", but she looked at me like only a mother can and just said...Things look different off a hanger! and guess what I put the dress on and it was like that "WOW" factor happened. They know their stuff these two ladies. I got not only my dress, my bridesmaids flowergirl and mother of the bride. Hey why ruin a good thing when you have it. Their service is amazing. Not like any other place I went to. they take pride in what they do and they want you to be happy. They treated my mother so well since she was sick and sometimes had to cancel or make longer appointments since she moved a little slower. Love these ladies and I thank them again for making me my girls and my mother look beautiful on my special day. Everyone was in awe of my dress...and they made it a very very special experieince for us. But, in retrospect, that all could have been avoided if wed asked more questions. But, it all worked out in the end!! If youre looking for that dress shopping experience you always imagined, GO TO ANGEL BRIDAL!!! I had such an amazing experience with Angel Bridals. I grew up in the area but now live in the UK. When I decided to plan an international wedding in six months, I was convinced there would have to be some compromise on the dress. At my mother's suggestion we made an appointment at Angel Bridals during a visit three months before the wedding. From the moment we walked into the shop, it felt like we were meeting with old friends. They took their time, let me try on a number of dresses and, when I found the *almost* perfect one, they figured out exactly what needed doing to make it "mine". They also skilfully managed the balance between slightly stressed bride and over-excited MOB. Needless to say, I found my dress at the first place I went to, and the follow up organising, straight through to my last fitting a week before the wedding (Christmas week) were fantastic. Thank you so much Rosemary, Vicki and Rosalba for making what could have been one of the most stressful parts of planning a wedding one of the more enjoyable! The ladies at Angel Bridals are AMAZING! Rose Alba did an amazing job altering my wedding dress. Rosemarie was an absolute joy to work with. I highly recommend Angel Bridals for bridesmaids dresses, wedding dresses and alterations. I found the most beautiful bridesmaid dresses at Angel Bridal! I live in Connecticut and my girls are from all over the island. AB was extremely accommodating since we weren't all able to come in at the same times. I didn't purchase my wedding dress from AB but they did my alterations which were perfect! All the women in the shop are super nice and supportive! Angel Bridals did a fantastic job on my wedding dress. I was disappointed to learn that they didn't carry the wedding dress I wanted, but I knew that they would do a beautiful job with the alterations and I didn't want anyone else to touch it. I am so glad a brought my dress to them. I originally purchased a size 8 and then I went crazy working out and getting in shape before the wedding. I lost approximately 20 pounds. They altered my dress and made sure it fit perfectly. My dress was all lace so this was no easy task. I think I only went there for two fittings and that was only because I didn't have the belt I wanted added to the dress with me the first time I went. I never tripped on my dress, it was the perfect length and even though it was strapless, I never had to pull it up. It fit like a glove. Two weeks before my wedding I learned that my maid of honor got ripped off online and received a faux Alfred Angelo dress. The dress was the completely wrong color. Angel Bridals helped me after I bought a size four dress off of eBay for my friend who was really a size six. They altered the dress with less than two weeks notice and she looked beautiful the day of the wedding. They truly saved me. Their prices are a little high, but I also believe you get what you pay for. They offer flawless work and when it comes to your wedding dress you should never cut corners. To be honest I never take the time to write a review. But I was so unsatisfied, unhappy and very very disappointed with Angel Bridal. When you go there they are as nice as can be until you make a purchase. I purchased my wedding gown and my mother purchased her gown. It is so exciting when you finally get the call that your wedding gown has arrived. I went as soon as I could to try it on and they made the experience awful. They were so consumed with another party of women to try to make a sale that my experience was just upsetting. I was not a picky bride in any way but my gown was a big deal to me. Then it came down to alterations for my mothers gown and mine. They were clueless to say the least. Thank goodness my mom went to school for design so she new what to tell them because I had to no clue. But the fact that my mom had to tell the so called professionals what to do is a major red flag. They kept trying to say that it was fine when the fact was it really wasn't! It ended up my mother was extremely unhappy with her dress but at this point did not have enough time to get a new one. She was the mother of the bride and deserved to feel beautiful. As for my dress it turned out it was big and I kept having to pull it up which I clearly stated I didn't want to have to do. Thank goodness I had asked for straps to attach, which I wanted to use later in the night but pretty much had to put on right after the ceremony. It was also to long so I had to hold it up all night which I also made clear that I didn't want to be bothered with! Like I had mentioned I never take the time to write a review but this place aggravated me enough to sit down and warn future brides. Every bride wants there dress to be perfect but this is not to place that will make that happen!